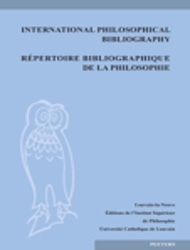 IPB online is available at Peeters Online Bibliographies: http://pob.peeters-leuven.be. Subscription to IPB Full edition also includes the print version of the bibliography (one volume per year issued in two parts). It gives unlimited access to the entire database, including the IPB Retrospective section containing bibliographical references from volume 36 (1984) to volume 48 (1996), which supports simple searches. Subscription to IPB (500€ per year) is reserved for institutions. For more information or to subscribe and benefit from three months’ free trial, please contact customer service at Peeters Publishers.